What I am about to admit upsets me. First of all, I’m a hypocrite (that’s not what upsets me – I’m fine with that). I spend a good deal of my time with the Food Network on in the background. I’m sort of sad that I’m missing the Next Food Network Star auditions in town next week, not that I’d really do it, but, I mean, maybe I would. And I have watched all three seasons of the Great Food Truck Race even though it really is quite boring and formulaic. What I don’t do, is make food from the Food Network Magazine. I just don’t. Except I did. Twice. This week alone. And I feel ashamed. It’s not that I don’t believe that they know how to make food – it’s in the name of the magazine for heaven’s sake – it’s just that I like to think of myself as someone with a slightly more refined palate and sense of adventure than a Food Network Magazine kind of person. Evidently I’m not. 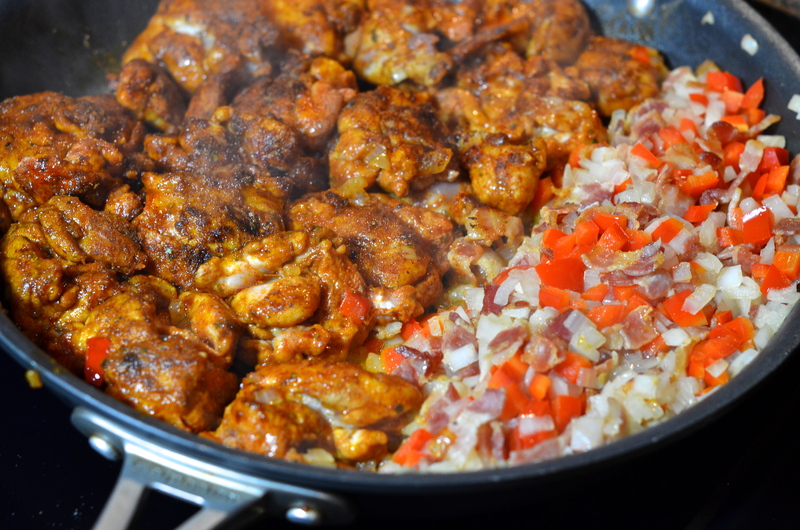 Prior to seeing this recipe I had never even heard of chicken paprikash. Immediately, I mentally lumped in it with goulash, given that there are things like noodles, sour cream and paprika in it and it has a slightly eastern European sound to it. It ended up being pretty tasty and might have been even better the next day. Like a haircut. Let’s get started. Heat a large skillet (that has a lid) over medium heat and begin sautéing your bacon (don’t use the lid now though). 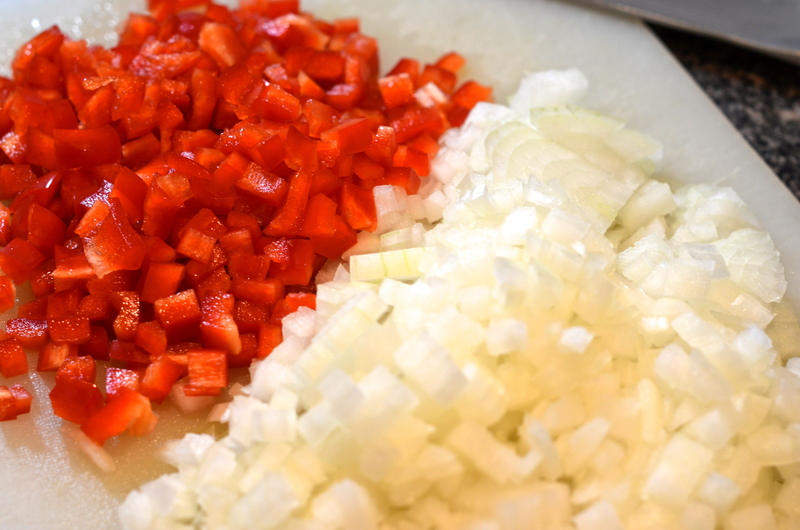 While that’s going down, dice your pepper and onion and have at the ready. Ok, go ahead and grab a large bowl and add the flour, paprika, marjoram and some salt and pepper. Toss the chicken thighs (feel free to use breasts if you prefer. I don’t judge.) in the mixture until everyone is nicely coated. 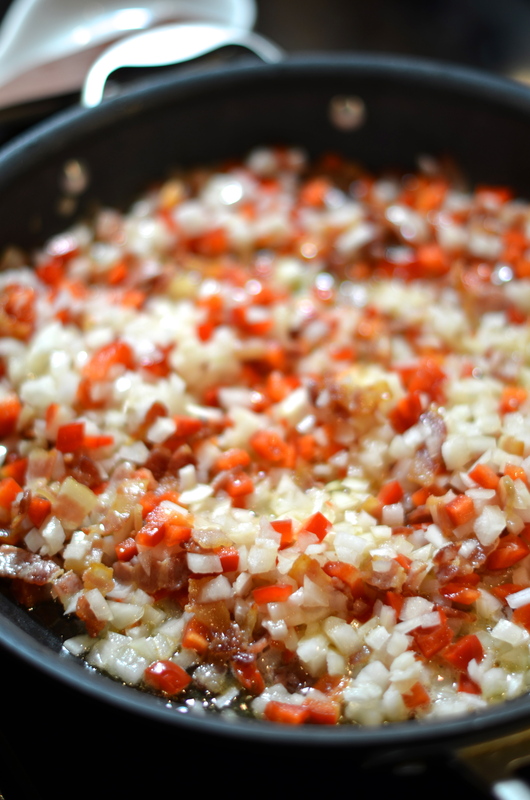 Once your bacon has begun to brown, add the pepper and onion to the pot and cook for 2-3 minutes. Things got weird here. I think this could go one of two ways. You could pull out the bacon, pepper and onion mixture and then brown your chicken, or you can push the stuff to the side and cram the chicken in there (which I did). Somehow it all fit, but it wasn’t really necessary. 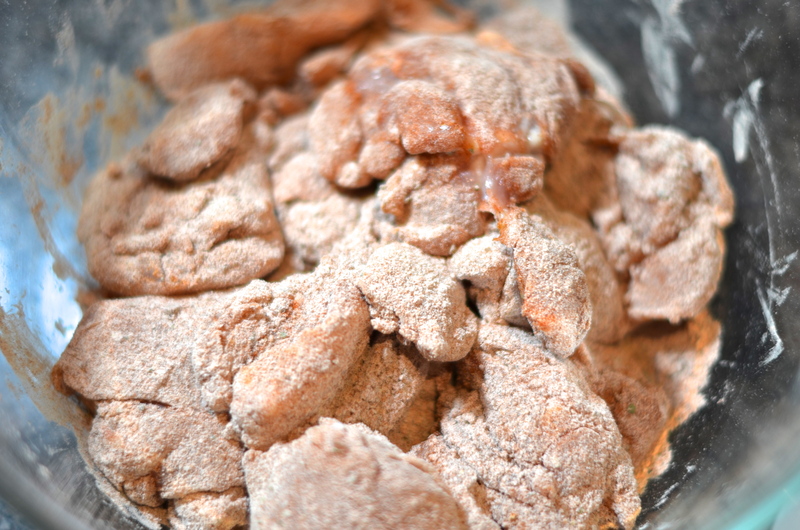 Also, be sure to add the rest of the flour and paprika mixture from the bowl to the pot. You’ll want that to thicken things up. I forgot that part so later on in the game I ended up putting 2 tablespoons of flour in a Pyrex measuring cup and adding some of the hot chicken stock to it and whisking the lumps away. I added that back to the sauce to get things a bit thicker. It helped. When everybody is nicely browned, stir it all together and then add the chicken stock and bring to a boil. 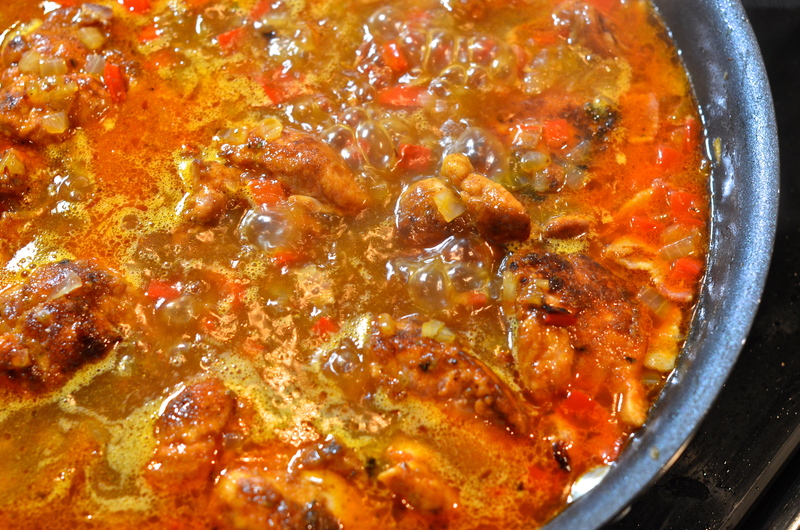 Reduce the heat to low, cover and simmer for about 10 minutes until the chicken is cooked through and things thicken up. While that’s happening, cook your egg noodles. When the noodles have cooked and the sauce has simmered, it’s time for the final touch. Uncover the dish, crank up the heat to high and cook another two minutes. If things look thin to you, now is the time to do the aforementioned flour trick. 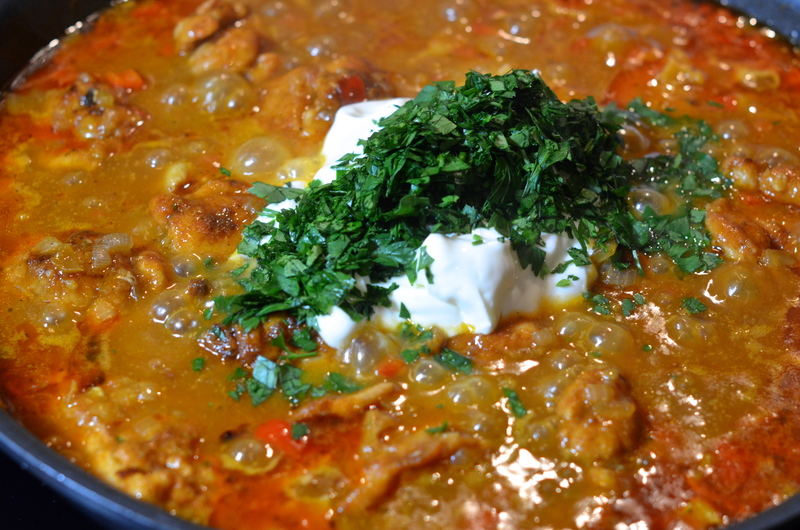 Bring the heat back to low and stir in the sour cream and parsley. Cook another two minutes or so. As expected, ladle this over the hot egg noodles and serve. I love egg noodles. I really do. We NEVER had them growing up but that may only be because I told mom I hated beef stroganoff. Digression. 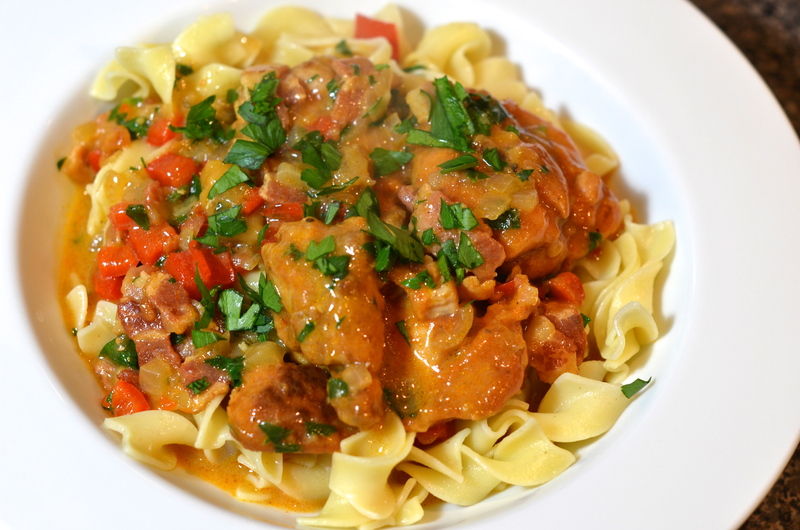 In honor of the EU winning the Nobel Peace Prize*, I give you what I assume is Hungarian chicken paprikash. I encourage you to enjoy it shamelessly. *Has society really run out of quality people that we are now awarding the peace prize to entire continents? Funny – I cooked (sort of) something from Food Network mag this week, and I had the same reservations about doing it. I’m not sure why (I think Sandra Lee ruined it for me a long time ago). The recipe I did was completely whole foods-based, so no cans or boxes were opened or harmed in the making of my beet salad. Of course, you hate beets, so I guess you won’t be trying that recipe any time soon. Also, every time I hear the word “paprikash” I think of When Harry Met Sally. It does not appear that you have too much pepper on YOUR paprikash, however. It looks delicious. I have never seen When Harry Met Sally (with the exception of the all-too-famous deli scene). It’s one of those classics that came out when I was too young for R-rated flicks and that I haven’t ever gone back to check out. I’ll clearly have to see it at some point. I didn’t feel like this recipe was too “semi-homemade” so I went with it. It’s ok sometimes. I’m glad to hear that you’re with me on this one. Thought I should update you – I FINALLY watched When Harry Met Sally this past weekend. Of course I loved it. Thanks for the reminder. Looks like dinner Sunday night to me! Since I don’t watch Food Network, I’m glad you do! Now I know that I don’t have to since you’ll let me know if there is something I need to try. 2) I love “The Great Food Truck Race”, but if the New Jersey girls had won this year I would have cried. I needed the Asians to redeem the Asian Cheating Scandal from Season 2. 3) I get the Food Network Magazine. I’m not ashamed. I refuse to watch Sandra Lee at ANY point, but I confess I love Alton Brown, and even Tyler Florence and Bobby Flay are growing on me. Giada…well, I can take her or leave her, but she was better after the last season of NFNS. Can’t you eat this without the sour cream? It would still be good – you should try it! Congratulations on your sweet new little man – I hope I get to meet him soon!!! A wonderful Sunday night supper and a big hit with all ages. I’ll be making this again! Easy and tasty! 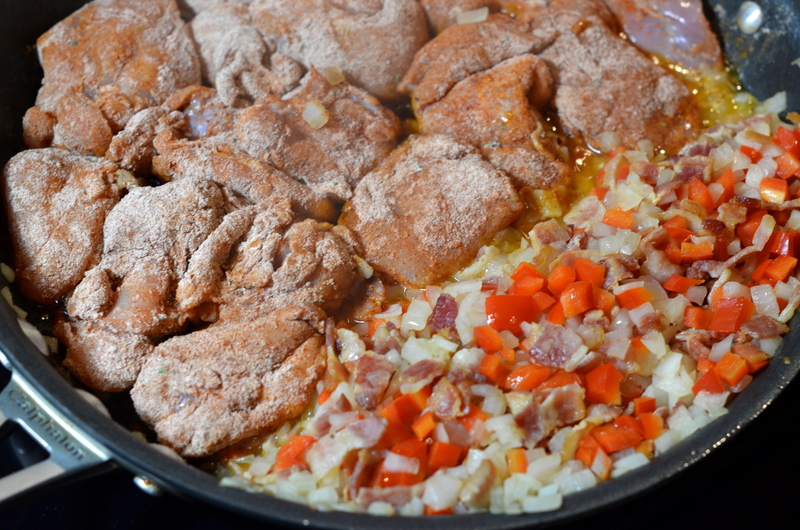 Mmmm – I love me some paprikash. I had no idea what it was the first time I made it, either, but like you, dammit I was tired and just wanted something warm and delicious to eat without having to bust out 100 ingredients and tools. Yours looks mouth-watering! I’ll have to revisit this recipe soon. I’ll be interested to see what you do with it. I admit that the good thing about food network recipes is that they are good ways to dip your toes into something new. The next step is to try to find something a bit more authentic and see where that leads. I’ll count on you for this!